Egypt's President Abdel-Fattah El-Sisi announced on Sunday the launch of a risk insurance fund to encourage Egyptian enterpreneurs to invest in Africa. In his speech during the closing ceremony of the Africa 2018 (Business for Africa and the World) conference in Sharm El-Sheikh, El-Sisi also announced the creation of an investment fund in the information technology infrastructure in Africa, based on the most up-todate technological systems, in order to build modern economies. Egyptian investments in African countries increased this year by $1.2 billion, to reach a total of $10.2 billion. More than 3,000 African entrepreneurs have participated in Africa 2018 from 8-9 December..
Around 41 prime ministers from the COMESA group have attended the forum, which saw discussions on infrastructure, entrepreneurship, investment, and women-related issues across the African continent. Several sessions were held on the first day of the forum under the theme "Entrepreneurs Day", including one on strengthening regional economic systems in Africa which tackled means of consolidating cross-border cooperation and opening up new markets for African economic blocs. The Egyptian President also announced the launch of a national strategy in Egypt to fight corruption under the auspices of the Administrative Control Authority. He also announced the launching of the National Academy to Fight Corruption. Egypt's Minister of Foreign Affairs Sameh Shoukry, Minister of Investment and International Cooperation Sahar Nasr, and a number of African leaders participated in the first panel at the forum. The forum started with a speech by Niger President Mahamadou Issoufou followed by a speech by Sierra Leone President Julius Maada Bio who stressed the importance of investing in Africa. President of Madagascar Hery Rajaonarimampianina also gave a speech at the ceremony highlighting the importance of trade for the future of the African continent. Minister Nasr said during her speech that Africa needs foreign investment worth $150 billion. 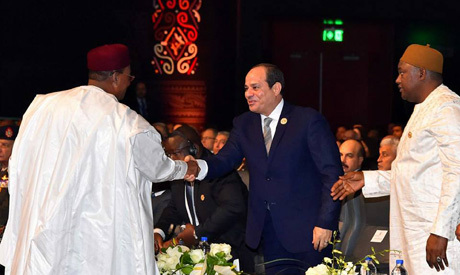 As he inaugurated the conference on Sunday morning, El-Sisi said "There are scientific and economic factors that determine the framework for development; however, the circumstances of our continent might not be able to meet these terms." "You have your own financing standards and we have our own circumstances, [we need] to build a bridge between us," said El-Sisi. "Egypt has come a long way in economic and social reform, structural reforms in various sectors, and the creation of a more attractive environment for domestic and foreign investment." "These reforms have contributed to improving Egypt's economic indicators and credit ratings," said El-Sisi. The president said that Egypt wishes to share its expertise in implementing economic and social reform with other African countries undertaking economic reforms. El-Sisi said that successful reforms require the development of roads, airports, ports, electricity, energy, water and sanitation networks.